To επόμενο Σάββατο στις 17 Νοεμβρίου εξορμούμε στο δάσος της Βασιλικής για συλλογή μανιταριών και πικ νικ ...καιρού επιτρέποντος! Όποιος επιθυμεί να συμμετέχει , παρακαλώ να επικοινωνήσει στο e mail αυτό ή στο κινητό μου 6977779314. Το Σάββατο 24 Νοεμβρίου θα πραγματοποιηθεί εθελοντικός καθαρισμός στο Νεοχώρι και καμπάνια ενημέρωσης των κατοίκων για την διαχείριση των απορριμμάτων μας. Επίσης θα γίνει παιχνίδι ανακύκλωσης και κομποστοποίησης για τα παιδιά. Όποιος επιθυμεί να βοηθήσει μπορεί να επικοινωνήσει μαζί μου. This Saturday the 17th November there will be an excursion to Vasiliki forest in order to collect mushrooms and have a picnic. 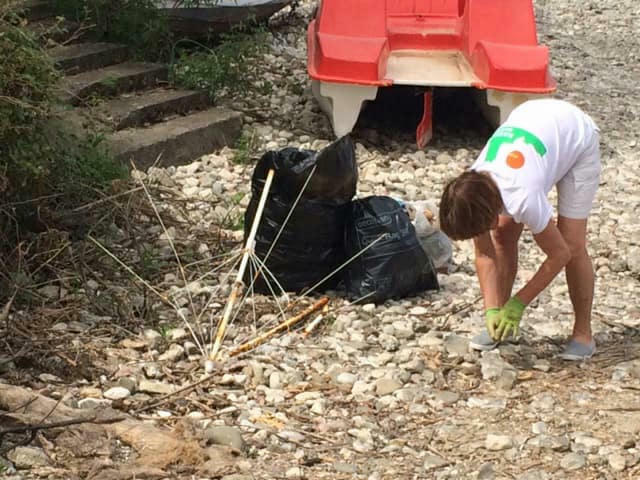 The following Saturday the 24th November there will be a volunteering cleaning up at Neohori. There will also be a campaign to inform residents about waste disposal and a recycling composting game for children. Anyone who would like to participate or help can contact me by email sophiachristof\gmail or call me on 6977779314. 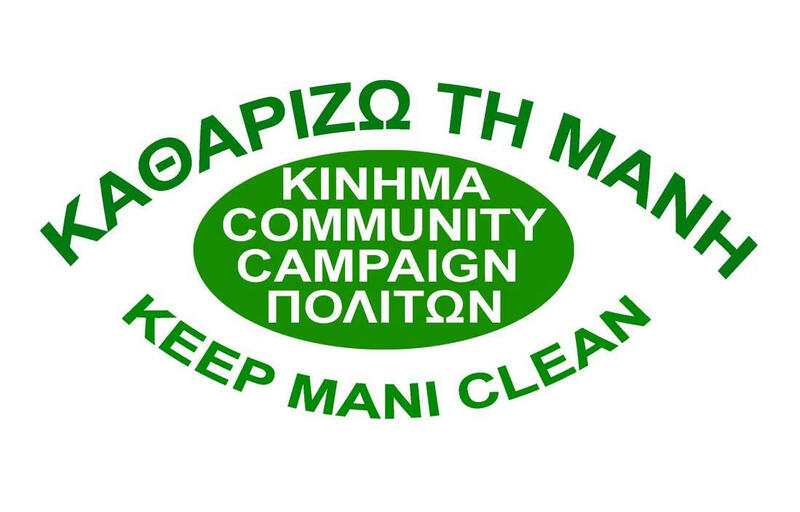 Clean Mani is holding a volunteer clean up campaign on Saturday 18th August in Exochori. The meeting point is at the Folklore Museum in Exochori (old school) at 19:00. 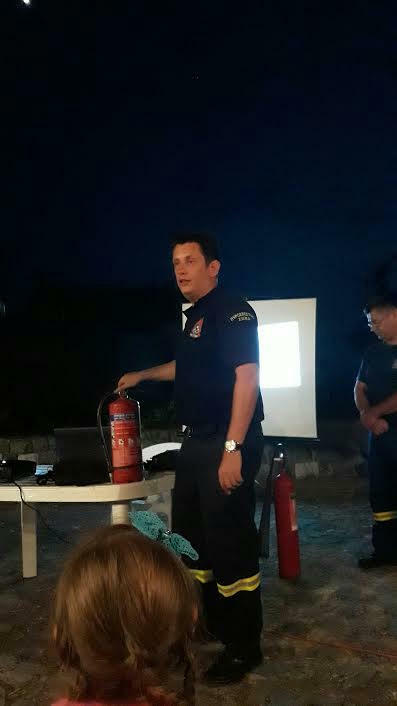 After the clean up, a lecture will be given at the Museum Hall at 20:30, by a fire brigade officer, Mr. George Festa, on the prevention of and how to deal with extreme natural phenomena (earthquakes, fires, floods). 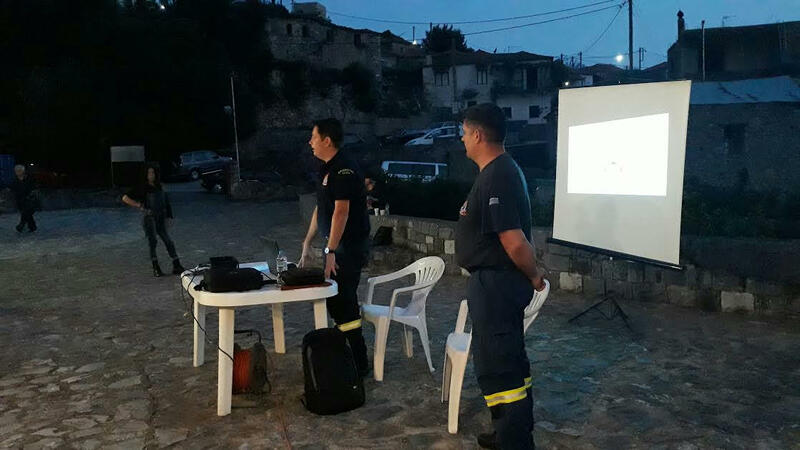 The recent deadly fires in Mati, Attiki and the floods in Mandra are a reminder that we all need to be prepared in the event of such a disaster. Eθελοντικό καθαρισμό θα πραγματοποιήσει ο Σύλλογος Καθαρή Μάνη το Σάββατο 18 Αυγούστου στο Εξωχώριο Δήμου Δυτικής Μάνης . Σημείο συνάντησης το Λαογραφικό Μουσείο (παλαιό δημοτικό σχολείο ) του χωριού στις 19:00 μμ. Μετά τον καθαρισμό θα δοθεί διάλεξη στον χώρο του Μουσείου στις 20:30 μμ από τον αξιωματικό του πυροσβεστικού σώματος , υποπυραγό, κ Γεώργιο Φέστα, σχετικά με την πρόληψη και αντιμετώπιση ακραίων φυσικών φαινομένων (σεισμών, πυρκαγιών, πλημμυρών ) κατόπιν προσκλήσεως από τον πολιτιστικό σύλλογο του Λαογραφικού και Ιστορικού Μουσείου Εξωχωρίου ''Η Ανδρούβιστα"". Οι πρόσφατες καταστροφικές πλημμύρες στην Μάνδρα και κατόπιν οι φονικές πυρκαγιές στο Μάτι Αττικής μας δίνουν ένα καλό κίνητρο να εκπαιδευτούμε από τους ειδικούς και να προετοιμαστούμε κατάλληλα και έγκαιρα σε περίπτωση που μας συμβεί μια μεγάλη φυσική καταστροφή. Είναι λάθος να τα περιμένουμε όλα από τους άλλους, η αστυνομία και η πυροσβεστική είναι πιο αποτελεσματικές όταν συνεργάζονται με ενημερωμένους και ενεργούς πολίτες. Το σπίτι μας είναι και το χωριό μας και η πόλη μας και το δάσος και τελικά όλη η Γη και δεν θά χει μέλλον αν ο καθένας μας δεν προσφέρει το ελάχιστο που μπορεί . Kathari Mani held a clean up day in Milea on Sunday 5th August in collaboration with residents and children of the village. 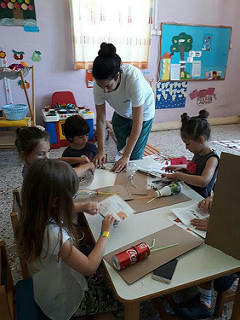 After the waste collection, a recycling and composting lesson was organized for the children of the area who participated with great enthusiasm. It is vital that communities are involved and aware about local environmental issues that affect the life and future of our planet. There will be a cleaning day at Milea this Sunday 5th August. Kathari Mani will be joined by the residents of the village in order to clean and to talk with the community about waste management. There will also be a game for children on how to separate organics and recyclables. Volunteers that would like to participate and help could join us or call Dr Sophia on 6977779314. The meeting place is Xanthianika, Milea at 7pm in the village square. 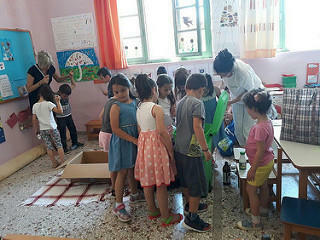 Kathari Mani recently visited the kindergartens in Kardamili and Stoupa to teach the children about recycling and composting. The children were very enthusiastic and happy to learn about how to separate organics and put them in the garden for making compost or feeding the animals. They also learnt about how to reduce the volume of recyclables and to avoid using plastic straws and bottles etc. At the end a pupil wore a plastic bag to show how difficult is for a bird to fly! Finally, bananas and juice were offered and children were asked to separate the peels for composting, the boxes for recycling and the straws for the gray bins. They managed to separate everything perfectly and for the next school year we are planning to make composting areas and offer blue bins to the schools of our municipality. 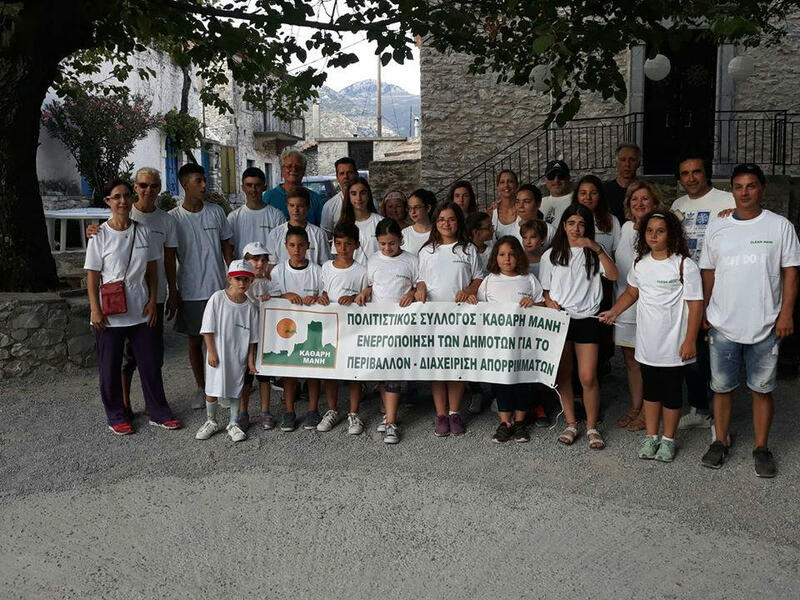 Kathari Mani had a successful cleanup day in Kardamyli. 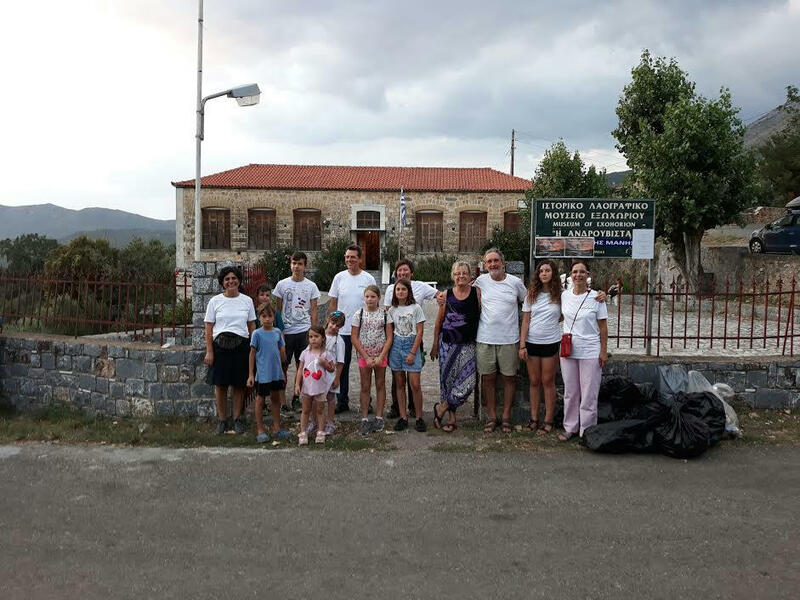 Over 15 volunteers cleaned up Ritsa Beach and roadside, Kalamitsi road and beach and some parts of the central road between Kardamyli and Stoupa. We noticed that most rubbish were recyclables like plastic bottles, glasses and cans. Afterwards we met at Kardamyli square for well deserved coffee and cold drinks. 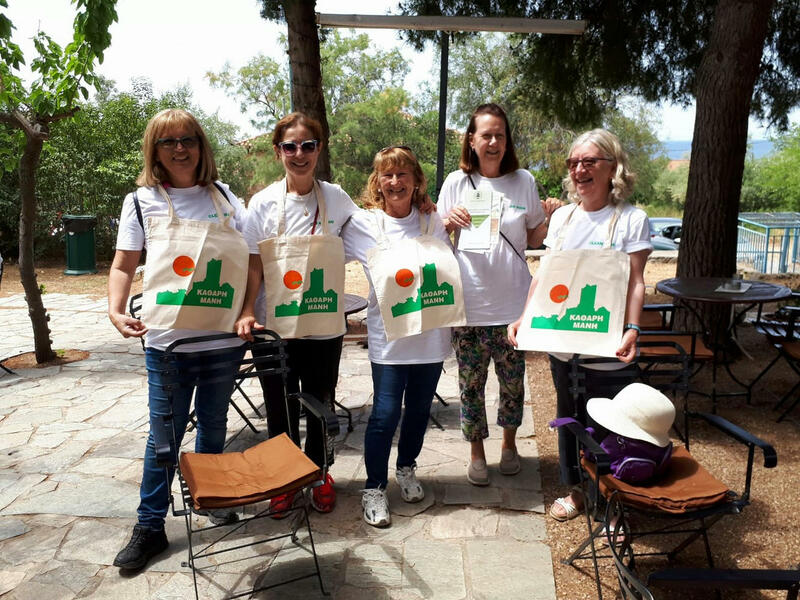 We handed out flyers and cloth bags to support the recycling campaign. At the end of this week we will be meeting to organise our next campaign. Join Kathari Mani on Sunday 29th April at 10am. 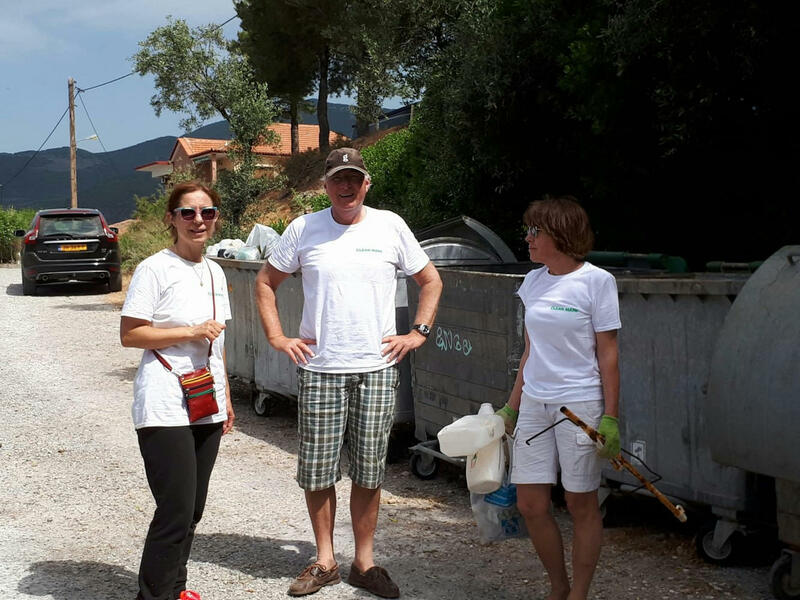 The group will be cleaning Ritsa and Kalamitsi beach and part of the road between Kardamili and Stoupa. 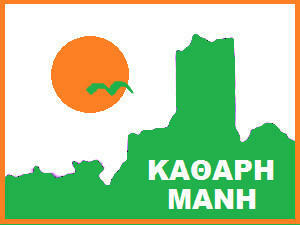 Meeting point at the townhall in Kardamili at 10am. 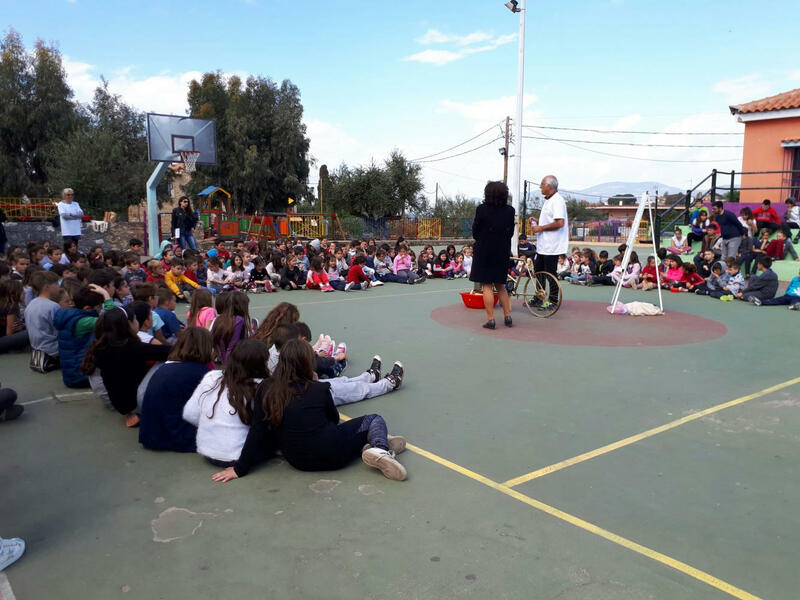 On Wednesday, March 14th, Kathari Mani delivered a free static recycling bicycle to Stoupa Elementary School. The bicycle has a special mechanism that crushes disposable plastic (cups, straws and mainly water bottles). This means students will be able to exercise and take part in recycling. The bicycle was built by the R.A.D.I.K.A.L.A. 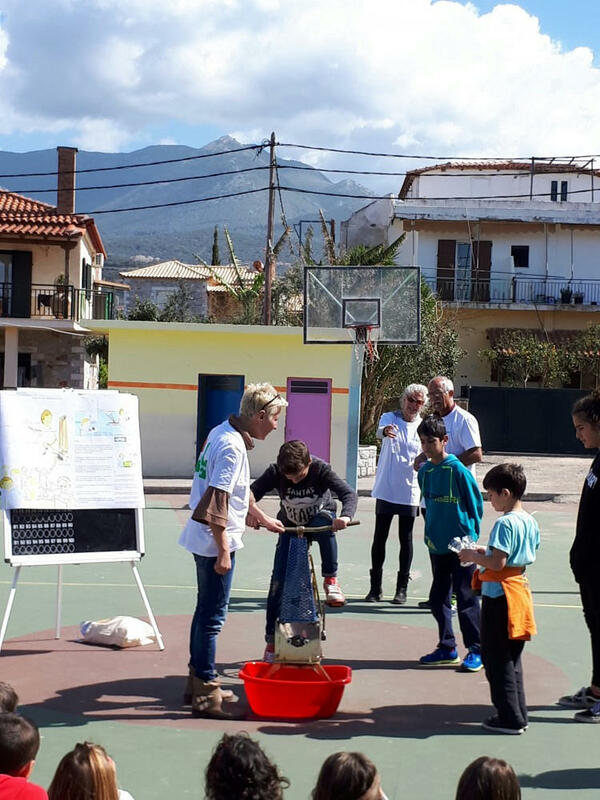 (Recycling, Awareness, Design, Innovation, Kalamata, Association), which aims to raise awareness of the environment and health through physical exercise and the creation of innovative recycling methods. The students were very excited to try out the bicycle and those who undertake several hours of cycling will receive free sailing lessons with the boats that will be made from the plastic fragments. We are very grateful to the Director of the school Mr. Katsika Athanasia, who along with the other teachers embraced this idea from the beginning. Την Τετάρτη 14 Μαρτίου, στο δημοτικό σχολείο Στούπας, έγινε από το Σύλλογο Καθαρή Μάνη, δωρεάν παράδοση ενός στατικού ποδηλάτου με ειδικό μηχανισμό ο οποίος θρυμματίζει πλαστικό μιάς χρήσεως (ποτήρια, καλαμάκια και κυρίως μπουκάλια νερού) προκειμένου οι μαθητές παίζοντας να εκπαιδευθούν στην ανακύκλωση και ν αφυπνισθούν γύρω από περιβαλλοντικά θέματα. Η κατασκευή του ποδηλάτου έγινε από την εθελοντική ομάδα R.A.D.I.K.A.L.A. 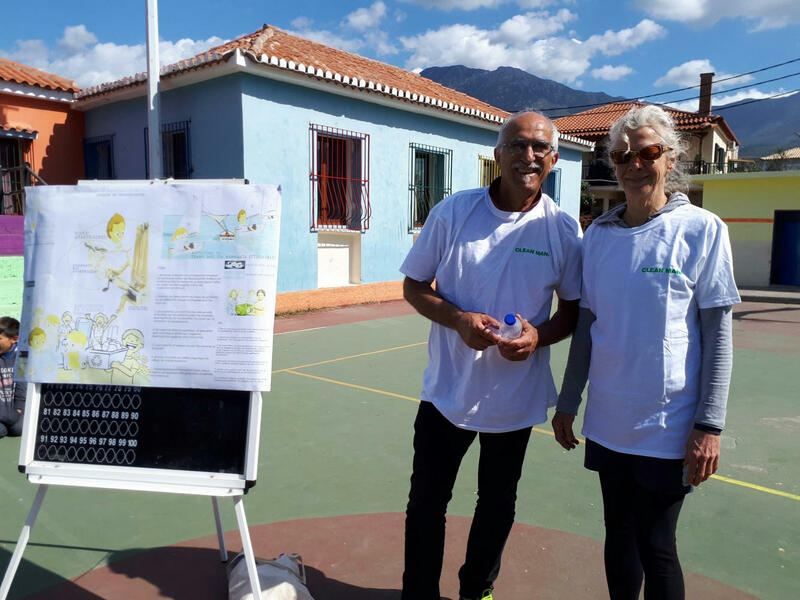 (Recycling, Awareness, Design, Innovation, Kalamata, Association) η οποία έχει σαν σκοπό , μέσα από την σωματική άσκηση και την δημιουργία πρωτοποριακών μεθόδων ανακύκλωσης, να ευαισθητοποιήσει τους πολίτες σχετικά με το περιβάλλον και την υγεία. Οι μαθητές μ' ενθουσιασμό και περιέργεια έκαναν μια πρώτη δοκιμή και όσοι συγκεντρώσουν αρκετές ώρες ποδηλασίας θα κάνουν δωρεάν μαθήματα ιστιοπλοίας με τις βάρκες οι οποίες θα κατασκευασθούν από τα θραύσματα αυτά. Ευχαριστούμε πολύ την Διευθύντρια του σχολείου κ Κάτσικα Αθανασία η οποία μαζί με τους υπόλοιπους εκπαιδευτικούς αγκάλιασαν από την αρχή την ιδέα αυτή και σύντομα θα σχεδιάσουμε όλοι μαζί (δάσκαλοι και σύλλογος ΚΑΘΑΡΗ ΜΑΝΗ) εκπαιδευτικές δραστηριότητες με περιβαλλοντικά θέματα μέσα από το παιχνίδι και την ενεργό συμμετοχή των μαθητών. Τα παιδιά γίνονται, πολύ πιο εύκολα από τους ενήλικες, δέκτες και πρεσβευτές γνώσεων και νέων αντιλήψεων. Είναι πιο δεκτικά και ευαίσθητα σε θέματα προστασίας των ζώων και του περιβάλλοντος και οι προσπάθειές μας πρέπει να επικεντρώνονται κυρίως σε αυτά. 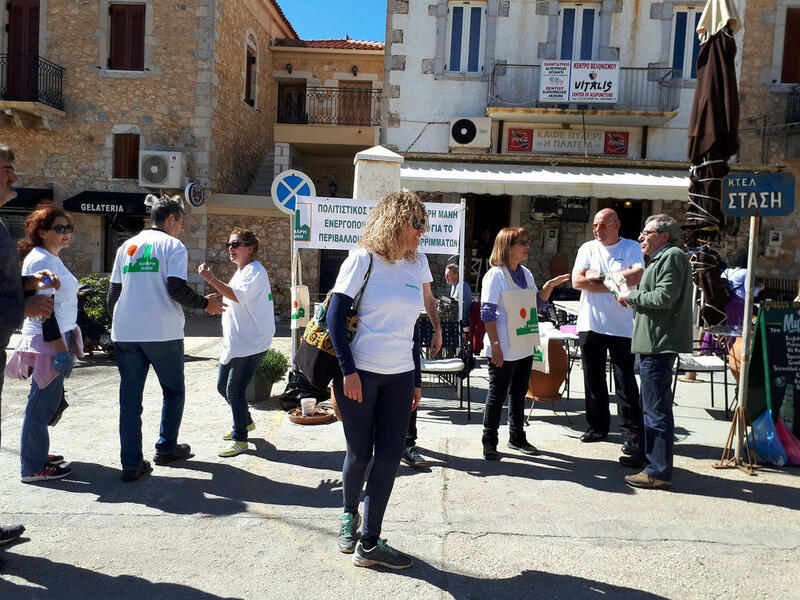 Kathari Mani had another successful campaign in Agios Nikolaos on Saturday 10 March 2018. 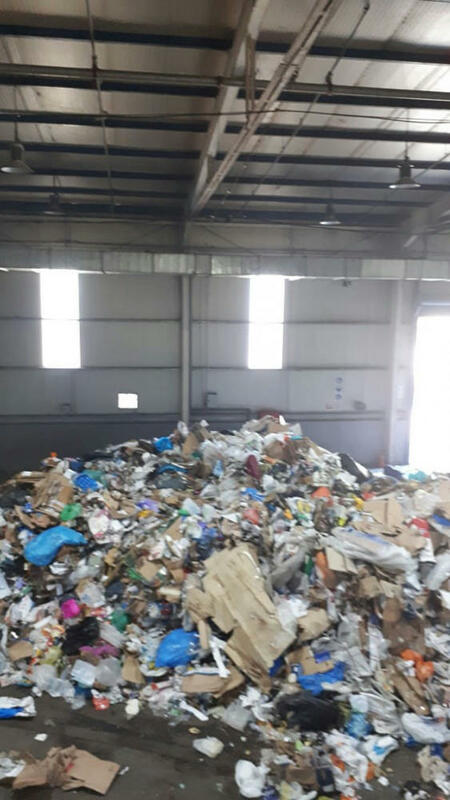 Members of the association informed people about recycling, waste management and composting branches and organics rather than throwing them into the general bins. 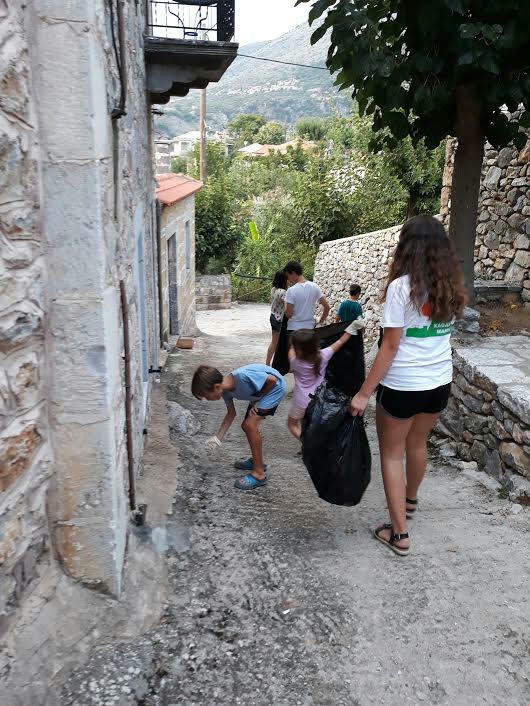 Members handed out cloth bags and T shirts to residents, and in parallel they cleaned around the village and the area between Pantazi and Agios Nikolaos. At the end of the event, everyone was treated to free bean soup, olives and cake . 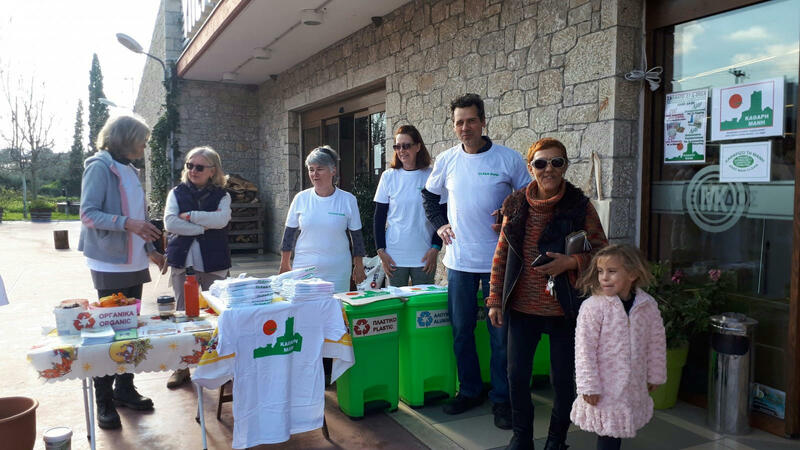 Kathari Mani held a successful recycling campaign on 27th January outside the supermarkets in Stoupa. The purpose of the campaign was to educate the local population about recycling and composting. 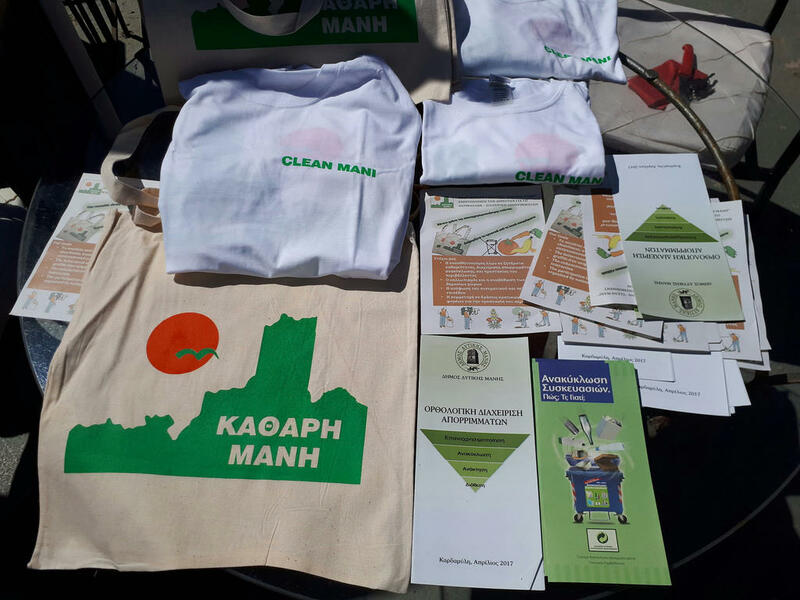 Information pamphlets were distributed and T shirts and shopping bags were sold with the logo of the Association. There was also a discussion to encourage people not to use plastic bags and in general disposable plastic (bottles, straws, coffee cups etc.). The proceeds of the campaign will buy a static bicycle that crushes plastic bottles from the Radikala voluntary organization. The bicycle will be donated to the Stoupa elementary school. Students using the bicycle will be able to reduce plastics to 1/65th of their volume. The fragments will be used to construct boat sections or for recycling. Members Our next meeting will be on Monday 22nd January at 18:30 pm. On Saturday 27th January between 10:00 am and 14:00 pm there will be a demonstration outside Katerina's Market and Panagiotopoulos market against the use of plastic bags and plastics generally. In parallel, we will inform people about recycling, composting and waste disposal and sell cloth shopping bags and t-shirts with our logo. If you would like to help or buy a cloth bag or T shirts please come along or call me on 6977779314 (or e mail me). Our constitution has finally been accepted and signed by the court (after 2 and half months!). We visited the private school Bougas some days ago in order to make sure that the bike that shreds plastic bottles (made by Radikala volunteering organization) works well. 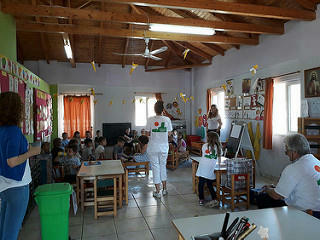 The bikes cost between 400 and 500 euros and we would like to donate one to the Stoupa primary school. We are asking for donations and also hope to raise funds by selling the cloth bags and t-shirts. Την επόμενη Δευτέρα 22 Ιανουαρίου θα γίνει η συνάντηση του Συλλόγου στις 18:30 μμ. Το ερχόμενο Σάββατο στις 27 Ιανουαρίου 10:00 πμ-14:00 μμ διοργανώνουμε καμπάνια μπροστά από τα σουπερ μάρκετ Κατερίνα και Παναγιωτόπουλος εναντίον της χρήσης πλαστικής σακούλας και γενικά πλαστικών μιάς χρήσεως και παράλληλα ενημέρωση για τον διαχωρισμό των απορριμμάτων μας και πώληση πάνινων τσαντών για τα ψώνια και T shirts του Συλλόγου. Όποιος θα επιθυμούσε να βοηθήσει μπορεί να επικοινωνεί μαζί μου στο e mail ή στο κινητό 6977779314. Το καταστατικό έχει επιτέλους υπογραφεί και μένουν μόνο οι κοινοποιήσεις σύμφωνα με την δικηγόρο μας κ Σπυρέα. Προ ημερών επισκεφθήκαμε το ιδιωτικο΄σχολείο του Μπουγά ώστε να διαπιστώσουμε από κοντά πως δουλεύει από κοντά το ποδήλατο που θρυμματίζει πλαστικά μπουκάλια και γίνεται πρώτη ύλη για την κατασκευή τμημάτων βάρκας. Θα δωρηθεί ένα τέτοιο στατικό ποδήλατο, το οποίο κατασκευάζεται από την εθελοντική ομάδα Radikala , στο δημοτικό σχολείο Στούπας. 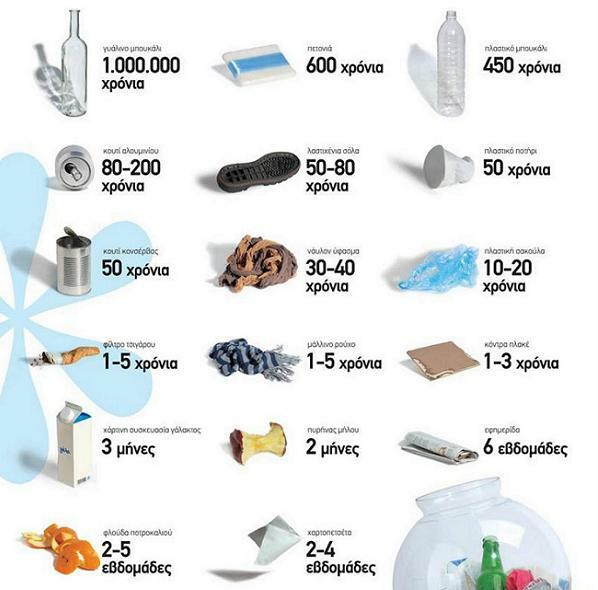 Το κόστος θα είναι 400-5000 ευρώ. Γι αυτό χρειαζόμαστε την συνδρομή σας. Πωλούνται πάνινες τσάντες και T shirts από μέλη του Συλλόγου. 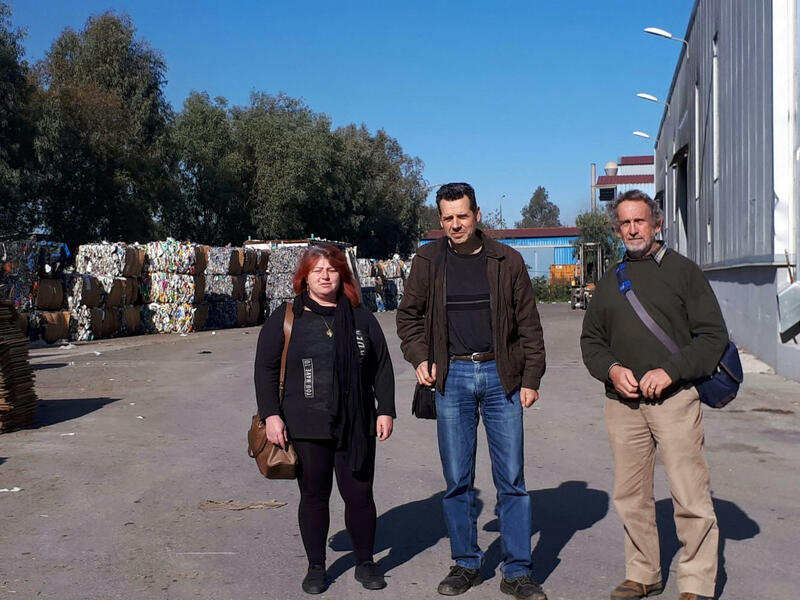 Representatives of Clean Mani visited the recycling centre in Kalamata on Wednesday 6th December. They were given an informative tour by Mr Karamanlis and Mr Kouzis who are responsible for the centre. Schools can also visit the centre. 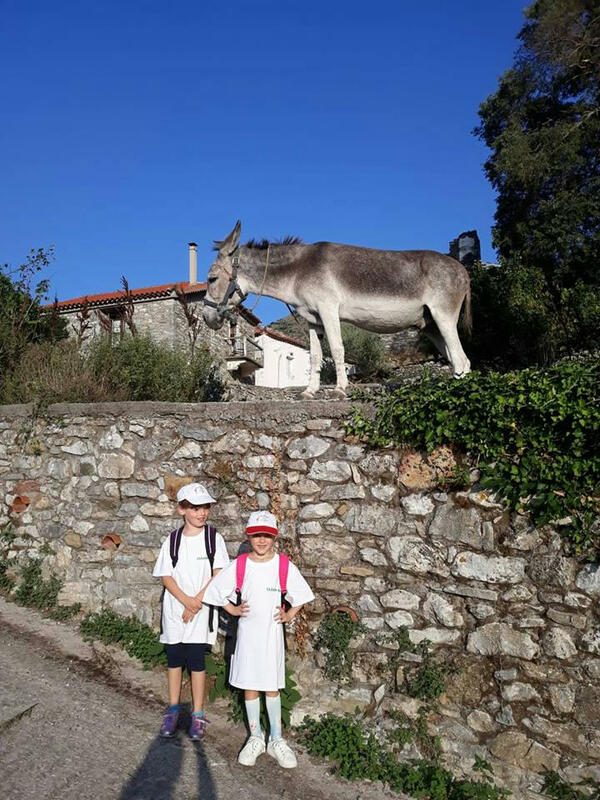 Next week we are meeting the teachers of the primary school in Stoupa and this will be one of the subjects under discussion. 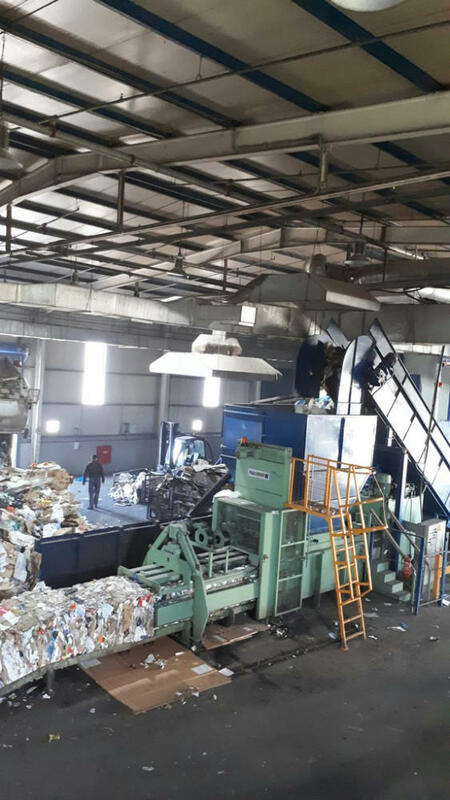 The centre advised that recyclables are received from Mani to the centre but that 30%-40% are mixed with rubbish. So it is important to educate people and especially children. They are willing to give us containers for recyclables that will be in a safe locked area. If we have employees or volunteers to open and accept recyclables twice a week it will be a good way to have clear recyclables. There will be a machine to press them. 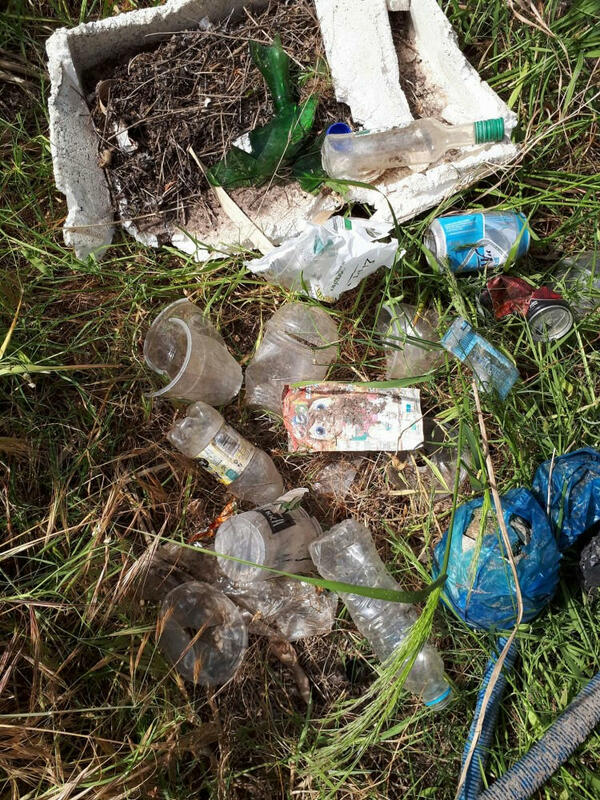 People that would like to participate and bring their recyclables can contact the Clean Mani association but first there will be an announcement. 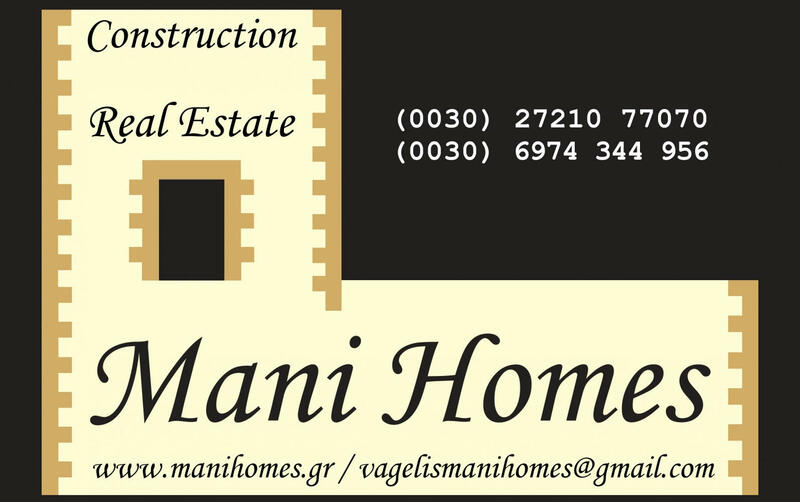 I would like to inform you that the following announcement for the foundation of our Association will be published in 'Tharros'' today and in ''Eleftheria '' newspaper tomorrow. This Monday, 27th November, there will be NO meeting at my office as usual. Whoever would like to participate in the school meeting with teachers during the first week of the December can contact me. We will meet one day next week to organise our suggestions. On Wednesday, 6th December at 10:30 am there will be a visit to the center of selection in Kalamata. If you would like to participate please advise me by Tuesday. 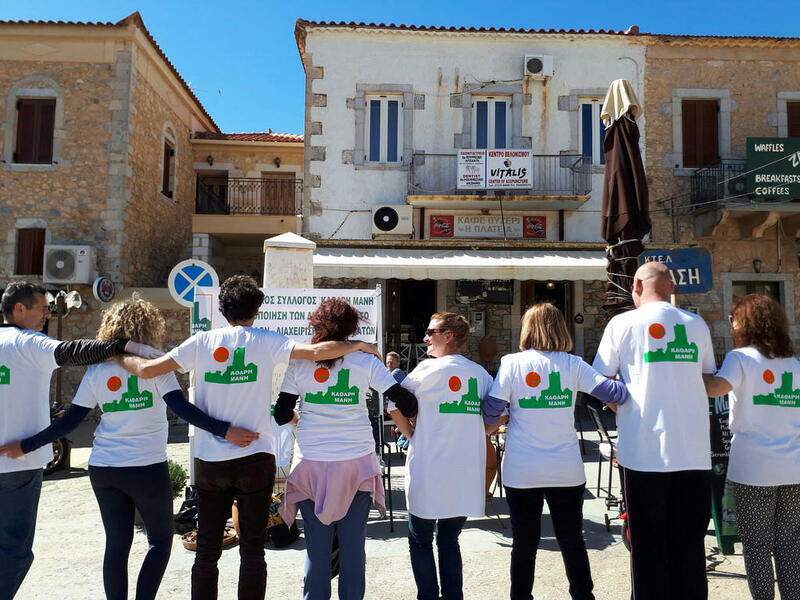 Our association “Clean Mani” was formed by a group of people who delivered actions on an ad hoc basis but to date it did not achieve the desired impact. During the last months, we joined forces hoping to mobilize everyone around the problem of the waste disposal that affects our area. Therefore, further to democratic debates held in several meetings, we submitted the statute of the Association to the Court of First Instance and we are starting to organize the future actions. Currently, we are inviting all residents of the area to become members of the association. The yearly contribution has been set to EUR 10. However, we welcome people who would like to participate in any of the actions of the Association, even without becoming members. Since we are volunteers, we would appreciate knowing how much time you would be able to dedicate to this and how you would be able to help so that we can organize the tasks accordingly. 6. Talks and seminars on a regular basis on issues concerning waste disposal. Currently we are looking for one or two spaces on farming land close to the coast area of approximately 5sqm each where a small-scale composting unit may be set up as well as other spaces for composting within our neighbourhoods. 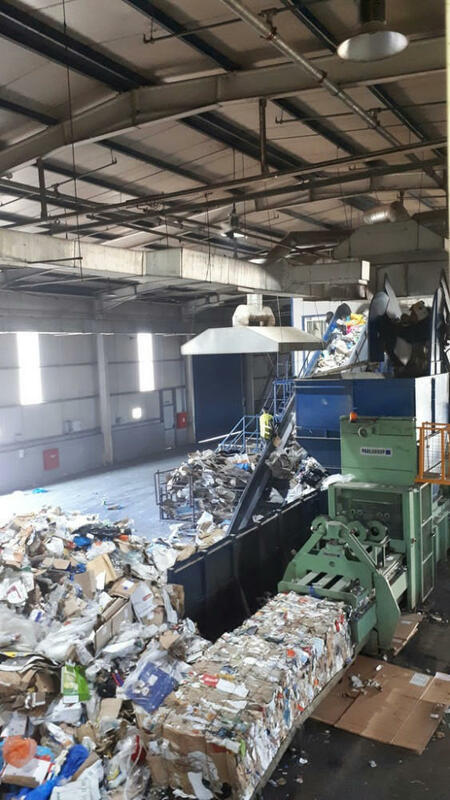 In addition, we are looking for a small room to store the pressing machine that is going to be donated to us by Mr Saranteas Sotirios and the processed recycled paper in order to protect them from the rain. We invite anybody who is able to support with any of the above to contact us. Suggestions, advice and offers of collaboration are welcome. θα ήθελα να σας ενημερώσω οτι σήμερα στο' Θάρρος' και αύριο στην' Ελευθερία' υπάρχει το συνημμένο κείμενο σχετικά με την ίδρυση του Συλλόγου. Ο Σύλλογός μας ΄΄ΚΑΘΑΡΗ ΜΑΝΗ΄΄ δημιουργήθηκε από κατοίκους της περιοχής μας που κατά καιρούς είχαμε κάποια δραστηριότητα γύρω από περιβαλλοντικά θέματα, που όμως μέχρι σήμερα δεν είχε καθολικό αποτέλεσμα. Εδώ και μερικούς μήνες ενώσαμε τις δυνάμεις μας ελπίζοντας να κινητοποιήσουμε τους πάντες γύρω από το ζήτημα των απορριμμάτων που ταλαιπωρεί την κοινωνία μας. Καταθέσαμε το καταστατικό στο Πρωτοδικείο, που δημοκρατικά σε πολλές συγκεντρώσεις καταλήξαμε και αρχίζουμε την οργάνωση των δραστηριοτήτων μας. Καλούμε τους κατοίκους της περιοχής μας να γίνουν μέλη του Συλλόγου μας. Η ετήσια συνδρομή έχει οριστεί σε 10€. Φυσικά και η απλή συμμετοχή στο Σύλλογο και στις κορυφαίες εκδηλώσεις του είναι ευπρόσδεκτη. Όμως επειδή είμαστε όλοι εθελοντές σ’ αυτή την προσπάθεια θα θέλαμε να μας απαντήσετε τί χρόνο θα μπορείτε να διαθέσετε και με ποιο τρόπο ώστε να μπορέσουμε να κάνουμε κατανομή δραστηριοτήτων. 1. Την κινητοποίηση των Σχολικών Μονάδων και Συλλόγων Γονέων. 2. Την διοργάνωση και συμμετοχή μας σε ενημερωτικές καμπάνιες του Δήμου ώστε να μπαίνουν τα απορρίμματα στους σωστούς κάδους. 4. Την συγκέντρωση ανακυκλώσιμων υλικών ( χαρτί, πλαστικό, κουτάκια αλουμινίου ) και ΄΄μπαλοποίηση ΄΄. 5. Δράσεις καθαρισμού ορισμένων περιοχών και για την ευαιστητοποίηση όλων μας να μή ρυπαίνουμε. 6. Ομιλίες και ημερίδες με θέματα τη διαχείριση απορριμμάτων. Αναζητούμε έναν δύο μικρούς χώρους οικοπέδων στην παραλιακή ζώνη της τάξεως των 5 τ.μ. το καθένα, που θα τσιμεντωθούν, ώστε να στηθεί μικρή μονάδα κομποστοποίησης, αλλά και άλλοι χώροι για κομποστοποίηση γειτονιάς. Επίσης, αν μπορέσουμε, να βρούμε μία μικρή αποθήκη να στεγάσουμε την πρέσσα ( μπαλοποιητή ) και τις μπάλες από χαρτί να μη βρέχονται. Όποιος γνωρίζει κάτι που μπορεί να βοηθήσει σε όλα τα παραπάνω παρακαλούμε να επικοινωνήσει μαζί μας. Είναι ευπρόσδεκτες: Συμβουλές, Προτάσεις και Προσφορά εργασίας. Σας ενημερώνουμε οτι κάθε Δευτέρα θα πραγματοποιείται συνάντηση του συλλόγου ΚΑΘΑΡΗ ΜΑΝΗ στις 19:30, στο ιατρείο της κυρίας Χριστοφιλοπούλου, με σκοπό τη συζήτηση καινούριων ιδεών, την υλοποίηση του προγράμματός μας και γενικότερα την οργάνωση του συλλόγου. Επίσης σας ενημερώνουμε οτι όλα τα έγγραφα για τη δημιουργία του συλλόγου παραδόθηκαν ση δικηγόρο κυρία Σπυρέα, οπότε πολύ σύντομα θα είναι και τυπικά έτοιμος ο σύλλογος. We would like to inform you that every Monday we will have a meeting of CLEAN MANI, at 19:30 on the medical office of Dr Sofia Christophilopoulou. We will discuss all the news of the association, all the actions we need to take and everything else regarding to the association. Σας ενημερώνουμε οτι θα γίνει συνάντηση του συλλόγου ΚΑΘΑΡΗ ΜΑΝΗ τη Δευτέρα 30-10 στις 19:00, στο ιατρείο της κυρίας Χριστοφιλοπούλου. Ο σκοπός της συνάντησης είναι η συλλογή των υπογραφών για τη σύσταση του συλλόγου, η συζήτηση προτάσεων-απόψεων επι της ουσίας του προβλήματος των σκουπιδιών, καθώς και η έναρξη και πρακτική εφαρμογή των ιδεών που θα έχει άμεσα και εμφανή αποτελέσματα στην περιοχή. The purpose of the meeting is to collect signatures for the establishment of the club, discuss proposals/views on the the problem of garbage, and start the practical application of concepts that will bring immediate and visible results in the region. Σας ενημερώνω ότι το Σάββατο 21 Οκτωβρίου θα γίνει εθελοντικός καθαρισμός στη Στούπα και στον κεντρικό δρόμο Νεοχωρίου Στούπας. Σημείο συνάντησης στην υπεραγορά 'Κατερίνα' στον κεντρικό δρόμο της Στούπας στις 09:30 πμ. Δεν πρέπει να περιμένουμε κάποιος άλλος να κάνει τον εξωραισμό και την καθαριότητα του χώρου που ζούμε. Είμαστε κι εμείς υπεύθυνοι να τον διαφυλάττουμε ευπρεπή και καθαρό και μισή ή μια ώρα συμμετοχή σε δραστηριότητες εθελοντικές όχι μόνο βελτιώνει την γενική εικόνα της περιοχής μας αλλά και δίνει ένα καλό παράδειγμα και στους υπόλοιπους κατοίκους να μην πετούν σκουπίδια και να νοιάζονται. 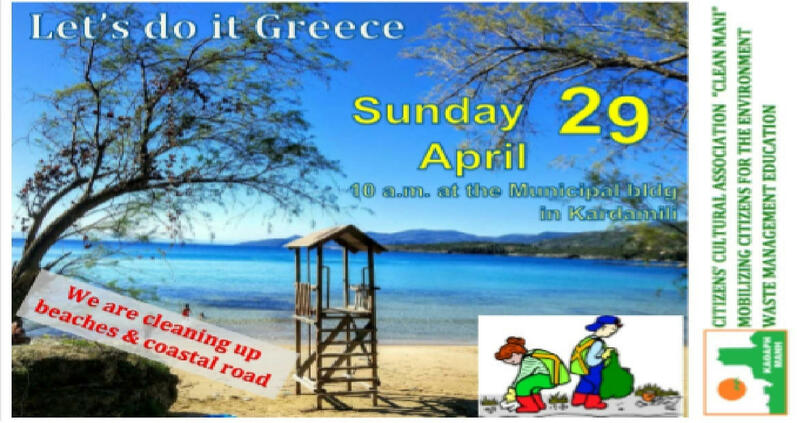 Οn Saturday 21st of October there will be a voluntary cleaning in Stoupa and on the road between Neohori and Stoupa. Meeting point is outside of Katerina s market on the main road at 09:30 pm. We must all participate and not expect others to clean the area where we live. We are also responsible for the good public picture around us and half an hour or one hour is enough to give , also, a good examlpe to all the inhabitants of West Mani not to throw rubbish and care. Dear friends, We would like to inform you about a lecture regarding waste management, by the agriculturist Mr. Stoyannis Evangelos. in the context of the two-day festival "Mani pulse - Art & Music festival". the CLEAN MANI Assoc. 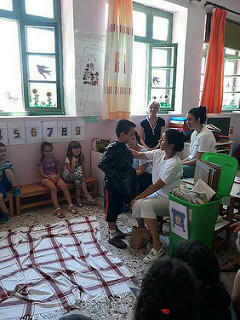 August 2nd Recycling event for children - a great success! Another successful cleaning day! 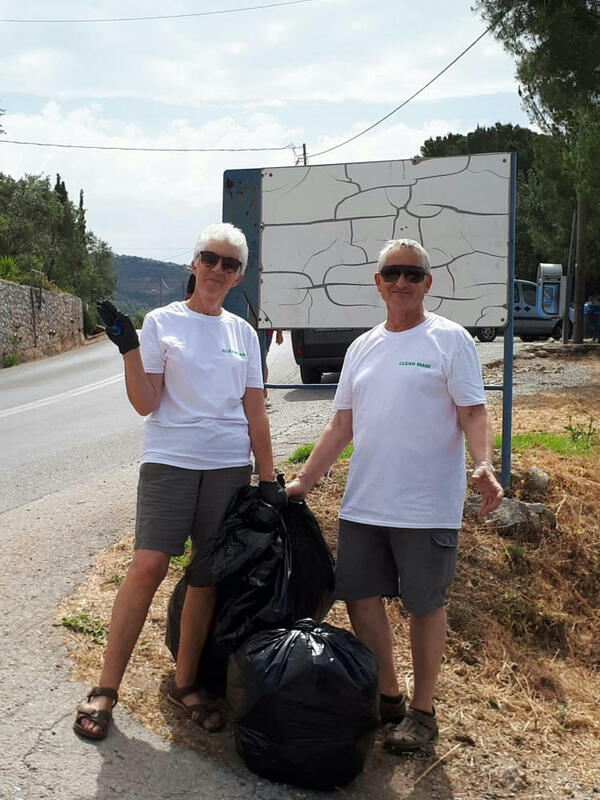 A group cleaned some parts of the road from Prosilio to Kardamili, Izabel Zeiss cleaned between Pantazi beach and Agios Nikolaos and the rest of volunteers around the bins and baskets of Stoupa and almost all the road from Kardamili to Stoupa. 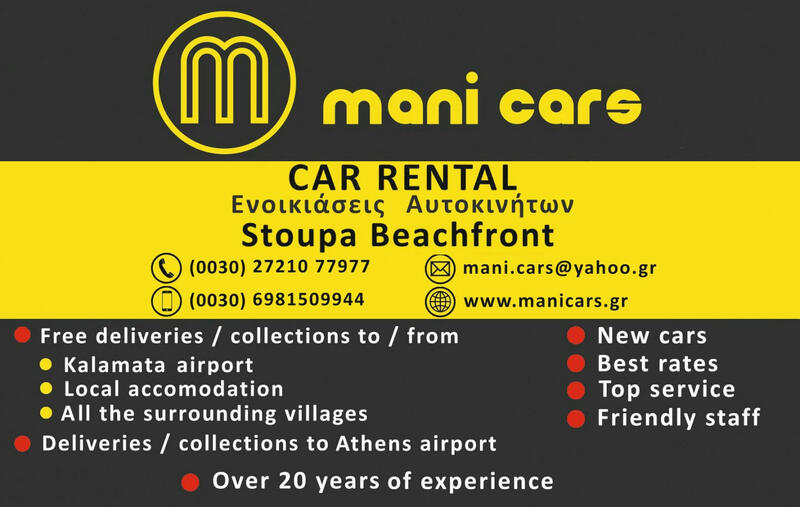 We are now enjoying to travel on the road of Mani! Unfortunately some people expect everything to be done by the Dimos. The Dimos is responsible for a lot of things but not for everything. We can try to give a good example to others but it takes a long time to change their way of thinking. Meanwhile we can clean our area and try to educate children and adults. 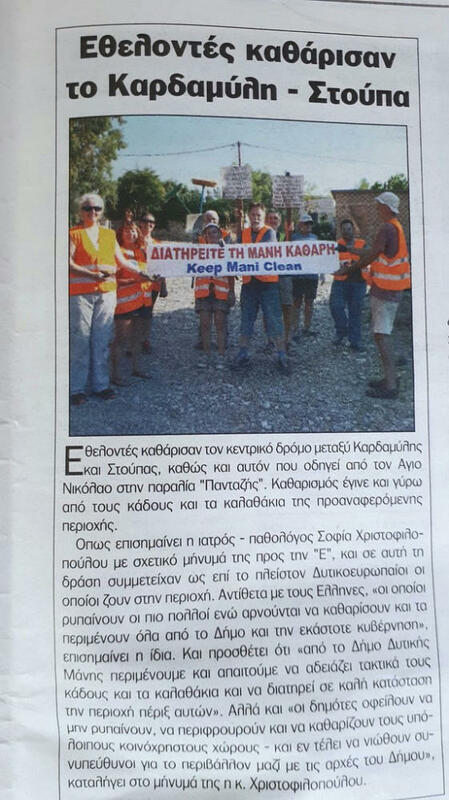 There is an article with photo on "Eleftheria "local newspaper in Kalamata (p.33 July 22/23). Thanks a lot all volunteers who participated in this cleaning day. 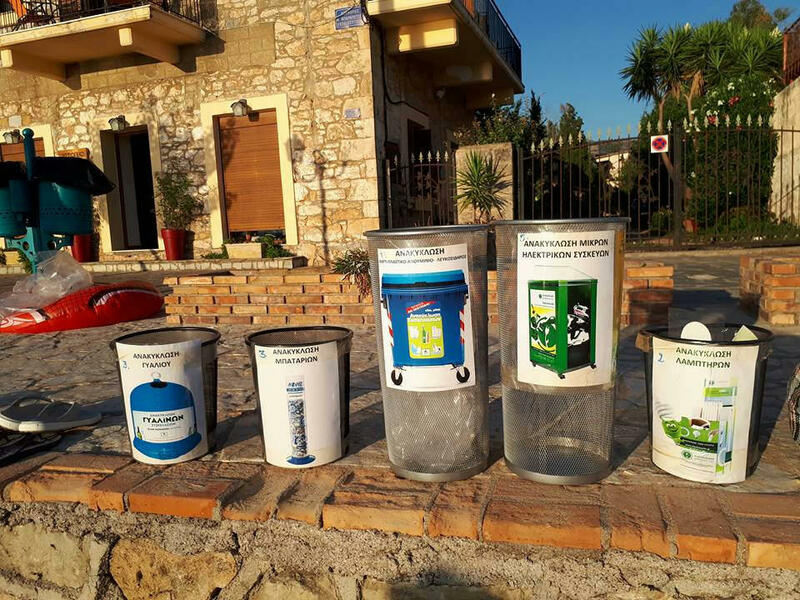 The CLEAN MANI Assoc has been working with the Dimos to prepare guidelines and regulations for the handling of solid waste in the W Mani municipality. Wednesday August 2nd at 19:30 there will be a painting competition for children so the best ones will be put on T shirts and cloth bags for sale. 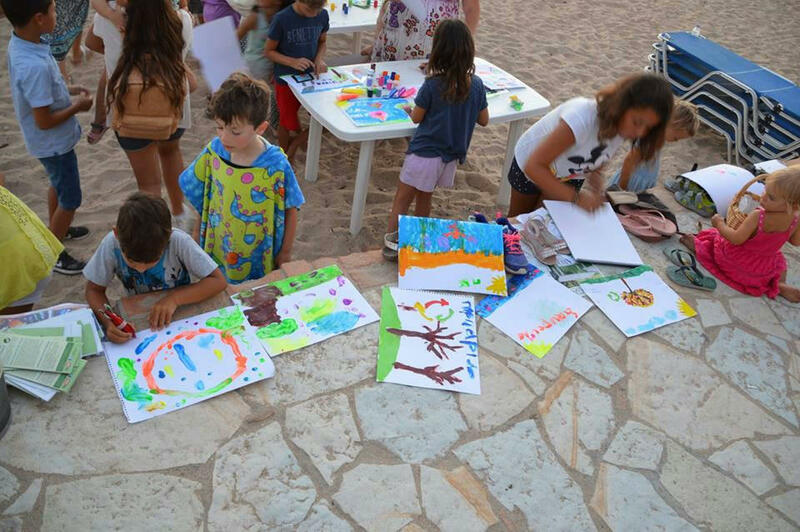 The children are going to paint ecological subjects and they will be educated how to separate rubbish . Recycling event for children: At a meeting in Dr Sophia's Office on July 15th, 7 volunteers & members of the 'CLEAN MANI' Assoc. decided to organise an event for children in early August. 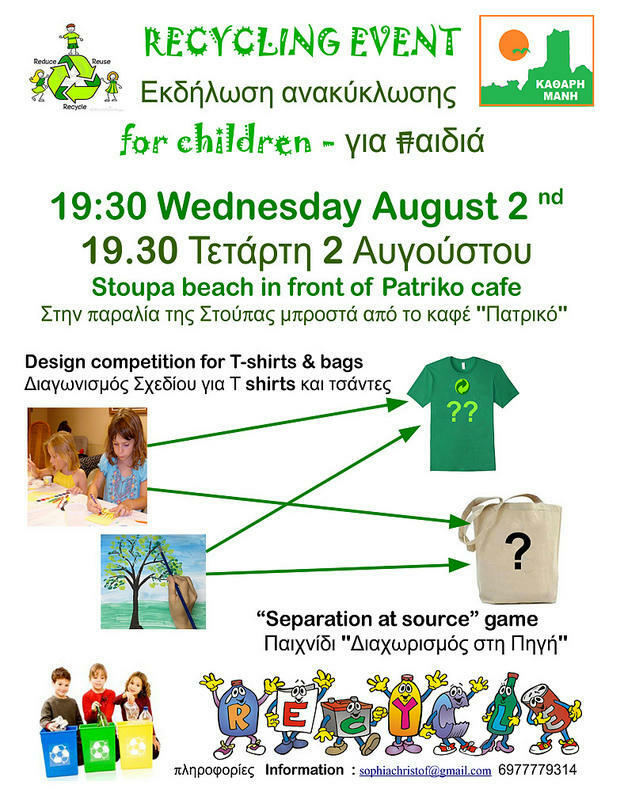 IT has since been agreed that the event will be held on Wednesday August 2nd, on Stoupa beach, outside Patriko Cafe/bar from 19:30. The plan is to ask children to paint, and use the best paintings on T shirts and cloth bags. 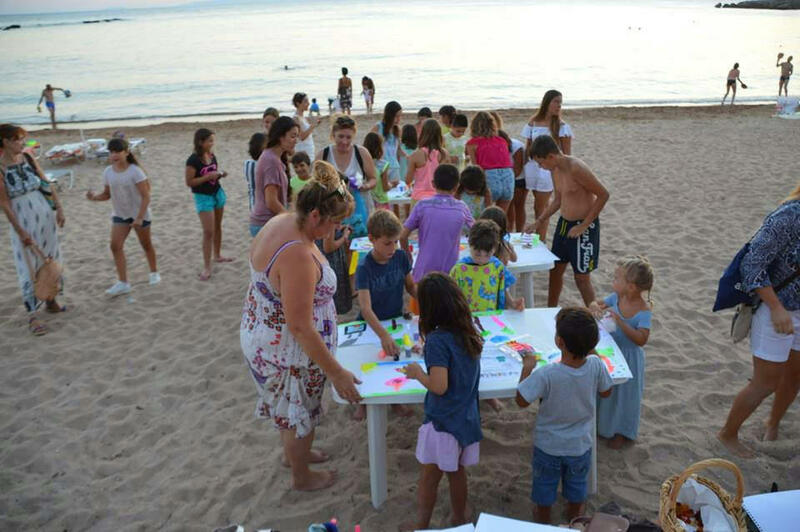 In a parallel activity, children will be asked to find and collect rubbish that has been put on the sand, and put items in the right bin. I would like to inform you that we have collected 1140 € and I'd like to thank you for your participation, your ideas, money and good words . 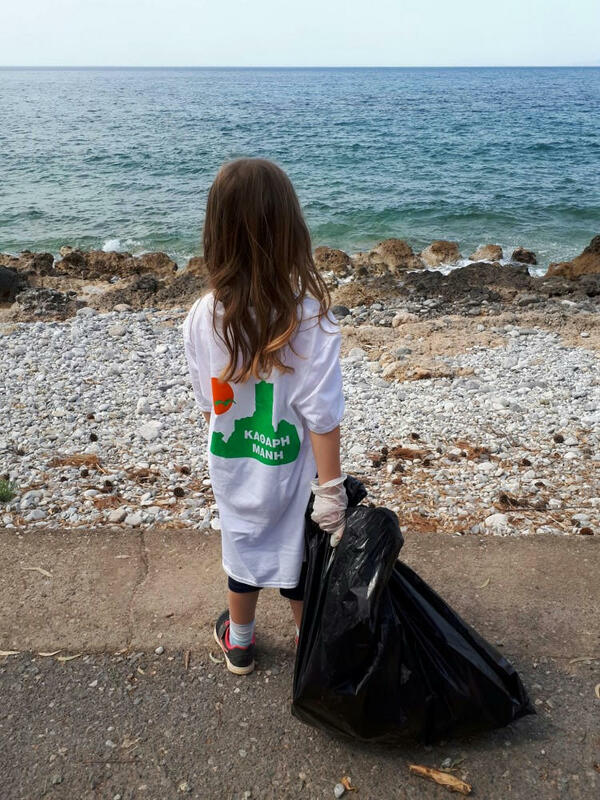 We all know that it is important to act for a clean environment around us which, now in summer with tourism, is polluted more as we observe everywhere on the roads and the beaches. 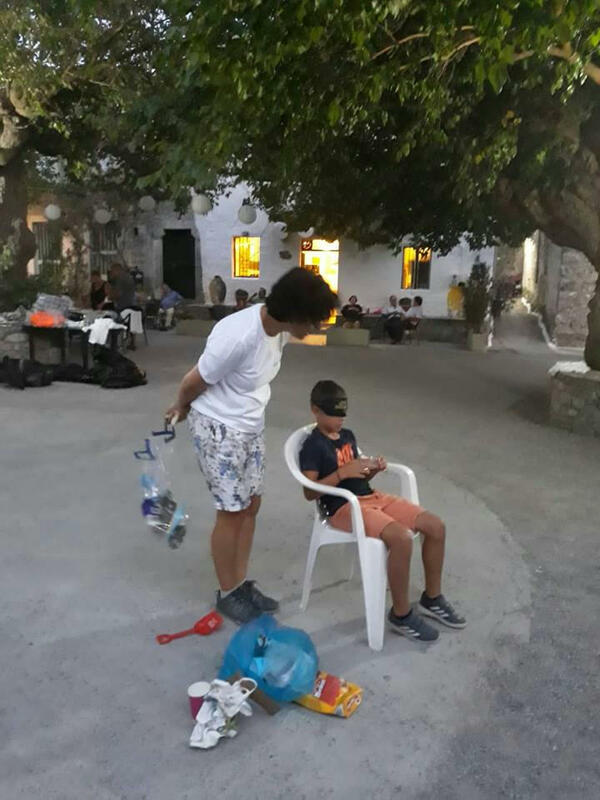 Last Saturday the 8th of July , we met with Tasos who is secretary of Patras KOINsep, at Maria's Kafenes and he talked together with Ilias Fikouras, member of it, about their experience. It was decided to start with foundation of the association and in the future, if some volunteers want they can found a KOINsep. This company has the right to sell compost and recyclables to cover its expenses (employees, a car , rent for a storehouse etc) and of course to improve the environment and also donates to the community, from its income. Our central goal now is to educate children and adults and decrease the volume of our rubbish. Our future activities are: Mrs Spyrea, our lawyer is going to prepare the constitution and all will be invited to express their opinions and come to a decision about the aims and means of the association 'CLEAN MANI'. Everyone who is interested to take part in a volunteer cleaning around bins, one of the next days, and everyone who is interested in participating in a meeting this weekend or next week to plan some actions in August, to inform and educate/motivate children and adults about recycling, composting and protection of nature against rubbish, through activities like painting, theater, movies etc can call me on 6977779314 or send me an e mail. 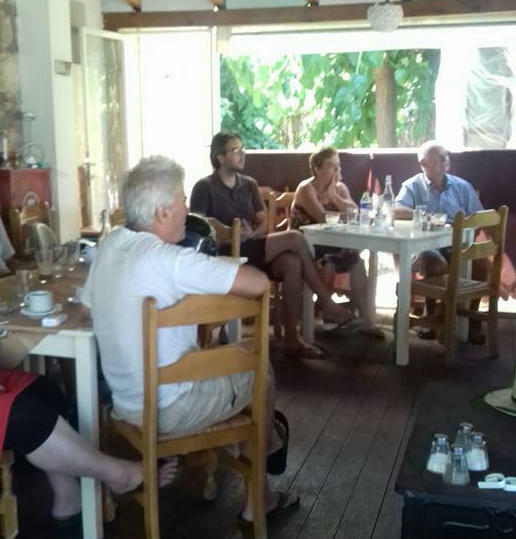 On July 8th a meeting of citizens was held in Maria's café in Stoupa. 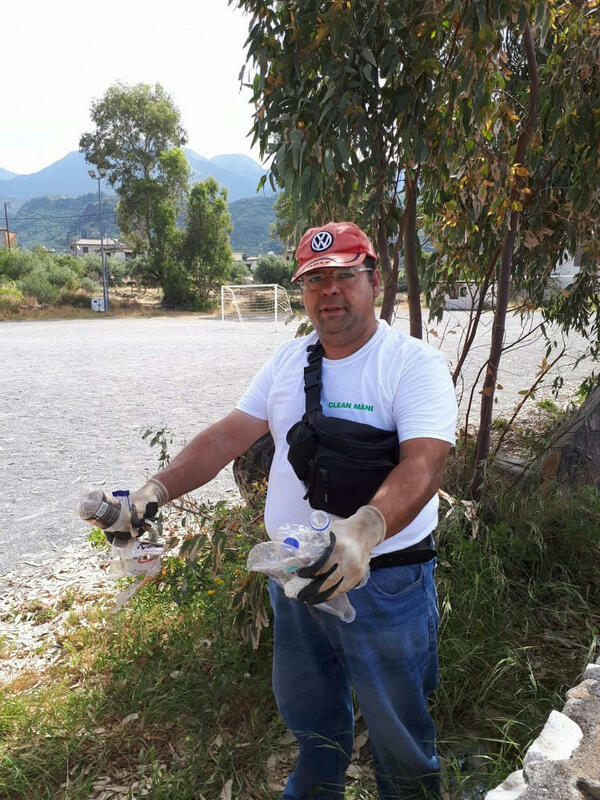 Tasos, secretary of KOINsep in Patras, which is a voluntary cooperative society, spoke to us about how they manage waste locally in Patras. It has its own site and collects recyclable electrical appliances, and cooking oil, as well as paper glass plastic and aluminium. 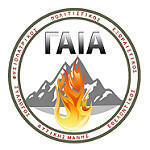 Tasos proposed that such a company should be established here, not a club. He believes that we can educate citizens and schools and at the same time engage in commercial activity so that we can earn money to pay our expenses. We can also make donations to the community. It was decided that in future, maybe a working group of volunteers can work towards eventually setting up a KOINip here. Mr. Kiskrakas considers it important to remove organics from the bins by training people and creating areas for compost production. For now, our goal is to create an Association and have elections in September. Those who have already paid, or want to be members can come to the clinic to sign. In order to found the association we need names and signatures of founding members. The lawyer will soon have the statutes ready, and a meeting will be announced to discuss and finalize them. Those who cannot come will receive details about it, by e-mail. 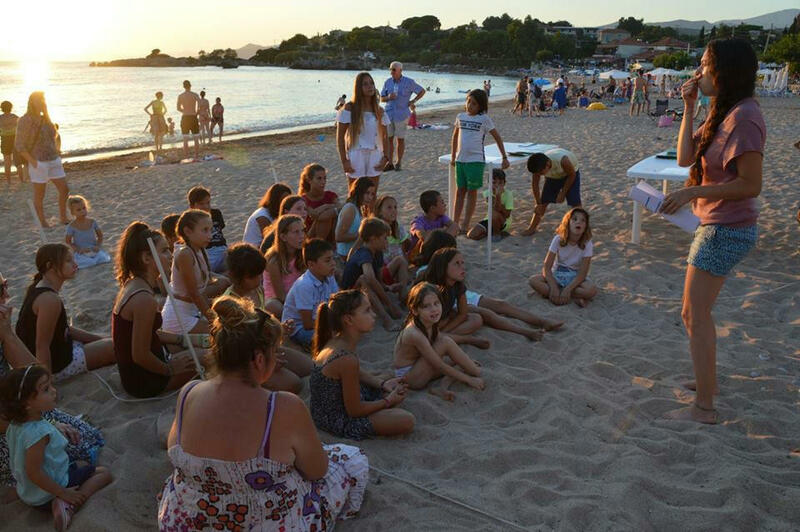 Message from Dr Sophia:- Next Saturday, the 8th of July at 10:30 am at Maria's kafenes in Chalikoura, Stoupa, there will be a meeting with a representative of KOINsep Patras which is a non profit company about recycling . Besides, there will be an update about our visit to Sparti and our meeting with the vice mayor Mr Argyropoulos. Finally we are going to talk about the form of the constitution and the potential that it can give us. Whoever would like to participate and express his/her opinion is welcomed. Message from Dr Sophia:- We had a brief meeting on June 28th, about the constitution of our new association. Mr Xioureas informed us about his visit to Patras and he showed us videos from the KOINsep in Patras which is a non profit company that manages and separates waste disposal in a part of Patras. 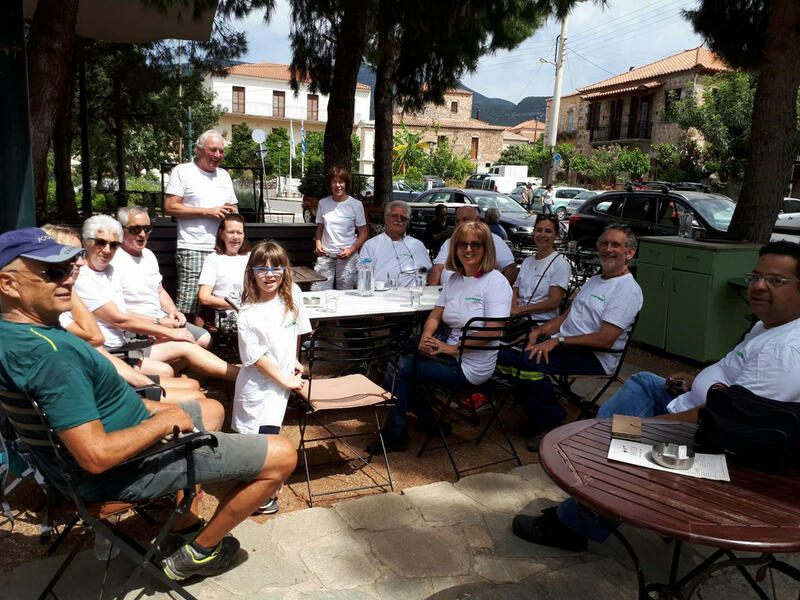 Next Saturday very early in the morning (07:00 am ) we are going to Sparti (Kiskyras, Xiouteas and I , and possibly Ilias Moutzouris ) to talk with the vice mayor Mr Argyropoulos and see in reality, what they are doing there. Whoever would like to come in his own car will be welcomed. This coming Wednesday at 18:00 pm there will be a short meeting at my office in Stoupa to talk about the constitution and Mr Kiskyras and Chiouteas will inform us about their visit to Patras last Friday, when they talked with citizens who have created a a Κοιν.Σ.Επ company. Whoever has any new ideas please come to the meeting, or send your ideas to my email. We must decide what form of association we can found. Next weekend we are planning to go to Sparti as well. Yesterday, there was a meeting of about 20 people in my office with the lawyer Mrs Spyrea Voula . We talked about the constitution of the new association ie what the goals will be, and the means of the association. We talked a lot about the possibility of founding a Κοιν.Σ.Επ company. It s a company that can have more activities than an association with one objective eg selling compost, renting a land, etc. Kiskyreas and Xiouteas are in Patras tonight to talk with citizens that took the initiative to create a company like this, and they are trying to educate people about compost and recycling. I do not know details yet. 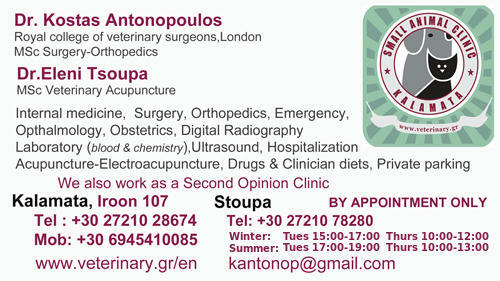 At the end of the month we are planning a meeting with two speakers one from Patras and one from Sparti. Hopefully they can come the same day otherwise separately. It s important before writing our constitution to have the knowledge and to clarify exactly what we expect to do about waste disposal. I'd like also to thank people that came to my office and paid for this attempt. We have already collected the money for the lawyer (550 euros) and shortly I'll announce the names of our first members and their contributions. Anyone who would like to pay 10 euros and be a member, can come to my office . I think we are going to have some money as a good start for the association. 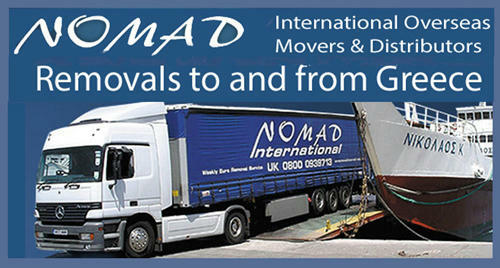 I contacted Dimos too, to let them know about our moves.